Stainless steel Grade 304 is the standard “18/8” austenitic stainless; it is the most versatile and most widely used stainless steel, available in the widest range of products, forms and finishes. It has excellent forming and welding characteristics. Grade 304L, the low carbon version of 304, does not require post-weld annealing and so is extensively used in heavy gauge components (about 5mm and over). Grade 304H with its higher carbon content finds application at elevated temperatures. The austenitic structure also gives these grades excellent toughness, even down to cryogenic temperatures. Grade 304 can be severely deep drawn without intermediate annealing, which has made this grade dominant in the manufacture of drawn stainless parts such as sinks, hollow-ware and saucepans. For severe applications it is common to use special “304DDQ” (Deep Drawing Quality) variants. Very good in a wide range of atmospheric environments and many corrosive media. Subject to pitting and crevice corrosion in warm chloride environments, and to stress corrosion cracking above about 60°C. Considered resistant to pitting corrosion in potable water with up to about 200mg/L chlorides at ambient temperatures, reducing to about 150mg/L at 60°C. Consult Atlas Technical Assistance for specific environmental recommendations. There is usually no difference in corrosion resistance between 304 and 304L. Grade 304H has higher strength at elevated temperatures so is often used for structural and pressure-containing applications at temperatures above about 500°C and up to about 800°C. 304H will become sensitised in the temperature range of 425-860°C; this is not a problem for high temperature applications, but will result in reduced aqueous corrosion resistance. Heat to 1010-1120°C and cool rapidly. These grades cannot be hardened by thermal treatment. Excellent weldability by all standard fusion methods, both with and without filler metals. AS 1554.6 pre-qualifies welding of 304 with 308, and 304L with 308L rods or electrodes (or their high silicon equivalents). Heavy welded sections in Grade 304 may require post-weld annealing for maximum corrosion resistance. This is not required for Grade 304L. Grade 321 may also be used as an alternative to 304 if heavy section welding is required and post-weld heat treatment is not possible. A “Ugima” improved machinability version of grade 304 is available in bar products. “Ugima” machines significantly better than standard 304, giving higher machining rates and lower tool wear in many operations. It is common for Stainless steel 304 and 304L to be stocked in “Dual Certified” form, particularly in plate, pipe and round bar. 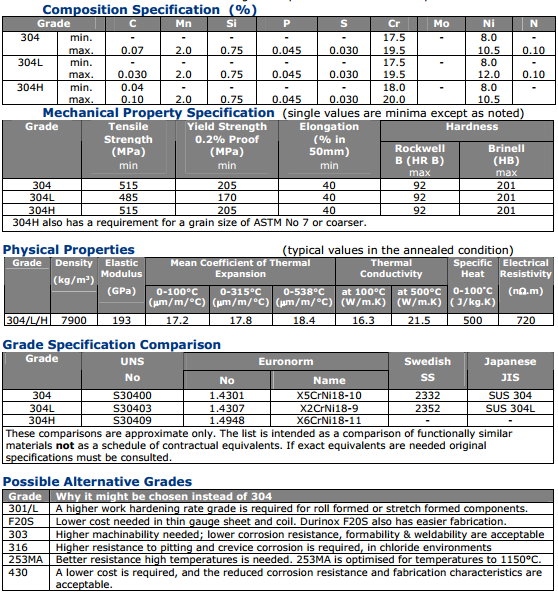 These items have chemical and mechanical properties complying with both 304 and 304L specifications. Such dual certified product may be unacceptable for high temperature applications. 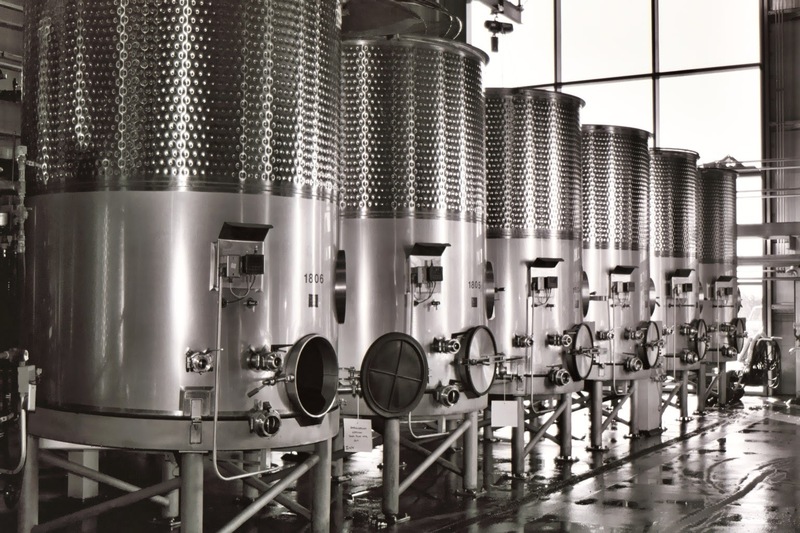 Food processing, transport and storage equipment, particularly in beer brewing, milk processing and wine making. Kitchen benches, sinks, troughs, equipment and appliances. Architectural panelling, railings & trim. Chemical containers, including for transport. Heat Exchangers. Woven or welded screens. Threaded fasteners. Springs. These properties are specified for flat rolled product (plate, sheet and coil) in ASTM A240/A240M. Similar but not necessarily identical properties are specified for other products such as pipe and bar in their respective specifications. Minor changes to 304 and 304L composition limits were made in 2006-7 to harmonise with similar grades specified in ISO and European standards.